Turn a science experiment classic into the ultimate Halloween science for kids experience! 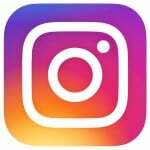 More Halloween science fun for kids at the end of this post. Recognize this post? I’m sharing it again today along with other fun hands-on Halloween activities for kids from friends! 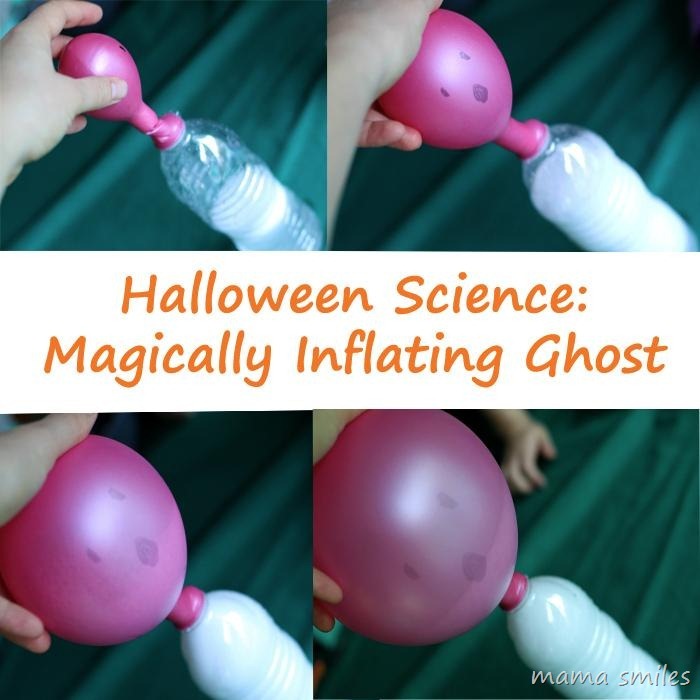 Ghost balloons make easy Halloween science for kids! 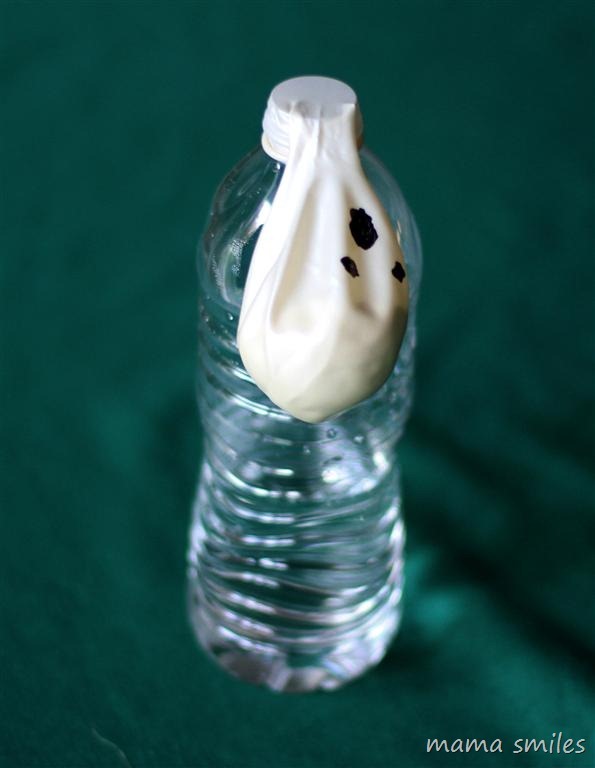 – all you need is a water bottle, balloon, Sharpie pen, vinegar, and baking soda! This is a fantastic Halloween science experiment for groups – check out the group photo from enjoying this experiment with my son’s second grade class below! Last year a friend and I ran this experiment for at least 100 kids as part of the kids’ noon science program at school. Draw a ghost face on the balloon, and fill it with about 1 Tablespoon of baking soda. Fill the water bottle with about half a cup of vinegar. 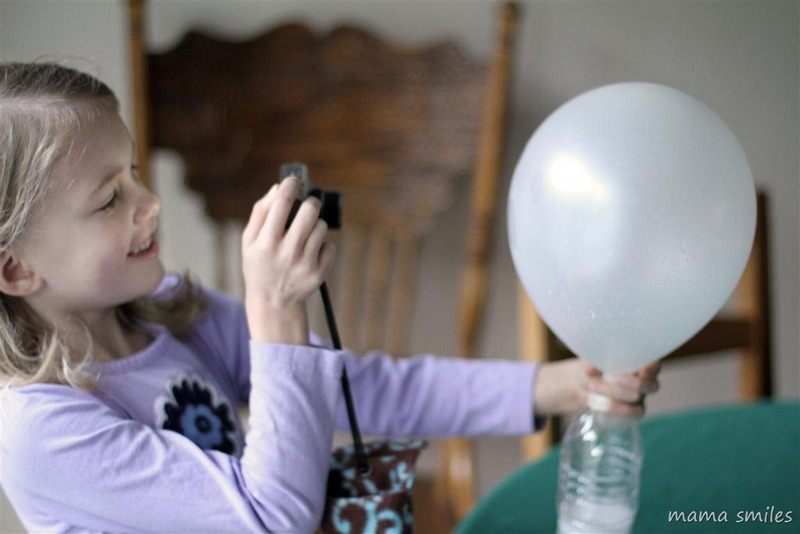 Attach the balloon to the top of the water bottle, lift the balloon so that the baking soda falls into the water bottle, and watch the magic happen! This activity is a great one for large groups of kids! My son’s second grade class made these fun ghost balloons. 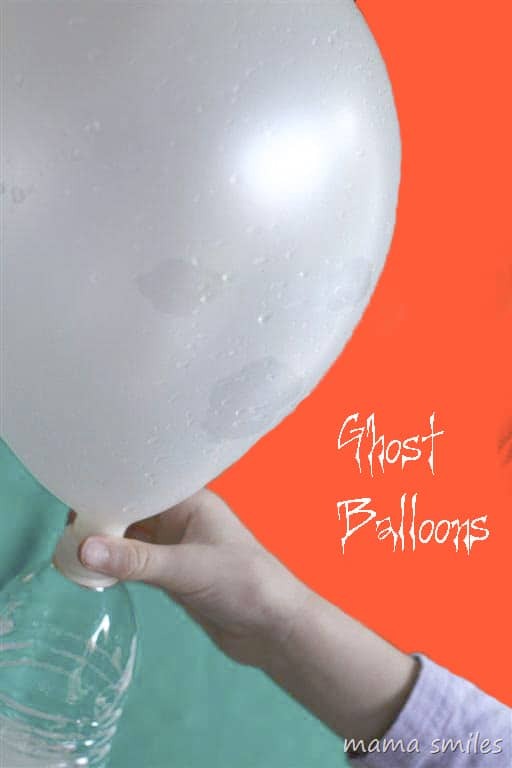 How Do Halloween Ghost Balloons Work? The two household chemicals, baking soda and vinegar, create carbon dioxide when mixed. Which we’ve uploaded to Youtube! Enjoy! 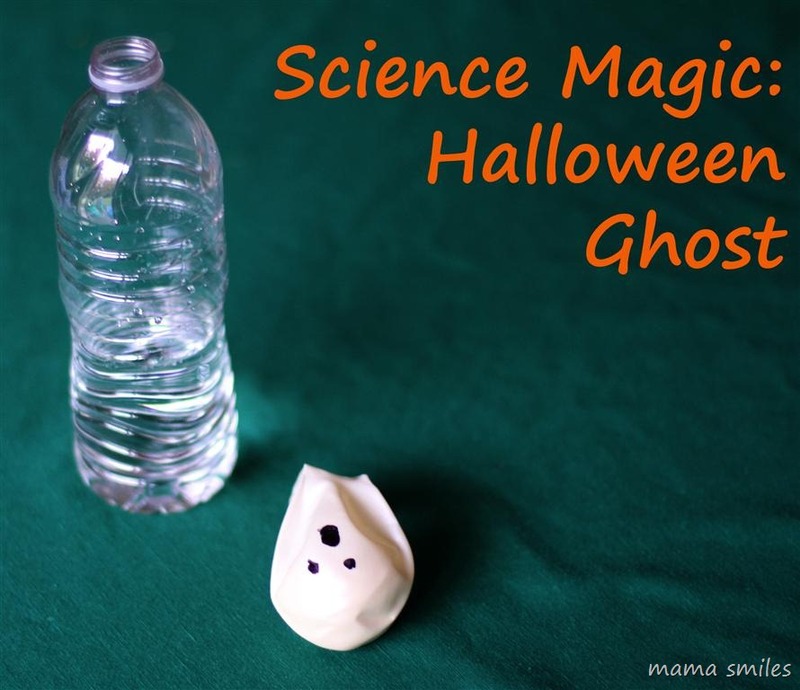 Do you have a favorite Halloween science experiment? How about a favorite Halloween activity or craft? 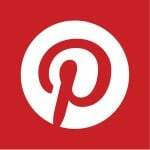 Check out this post featuring Halloween Activities for Preschoolers. Ha! This is a fun Halloween experiment! What a fun project for the kids! You know for all of the baking soda experiments we’ve done, we’ve never done this one. I should remedy that. What a great experiment! I think we’ll try this next week. Ahahahahahha that is a great variation! We’ve done this experiment, but not in a long time, and *certainly* not as a ghost. My kids are going to love this! My girls will love this – will definitely be trying it soon. Wow, it happens really fast! Cool! Awesome idea! It’s been a year since we did this experiment (non-ghosty), so it’ll be fun to see J’s excitement for the experiment again and have something new, Halloween related (that’s not messy or sugary). I might steal the idea for a Halloween post. I’ll link back up to you, for sure. 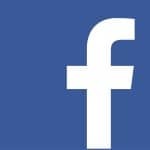 Go for it – glad you liked the idea! That is awesome! I am going to have to do this with my 3.5 year old! Oh, how fun!! We should have done this with our ghost crafts the other day! Thank you for sharing at Sharing Saturday!! Love it – Anna did a very similar experiment in her Mad Science class lately. These are amazing! :-) and your balloon blowing up worked much better than ours! The balloon was is neat, because it’s so unexpected for kids the first time round, even if they have done dozens of volcanoes! LOVE this so much! Will share! I apparently did not comment the first time around. I agree the pink makes it a particularly friendly ghost.